Gary Parkinson celebrates his play-off winner at Wembley in 1994 with David Eyres. For a couple of minutes, Gary Parkinson pieces together a sentence, flickering his eyelids to communicate the briefest of messages. Unable to speak, he uses his eyes to work through the alphabet, while his devoted wife Deborah patiently darts from A to Z and back. It is an exhausting, arduous process and then Deborah reveals Gary’s humbling words. It is typical of the fortitude of the man, whose Football League career as a marauding full-back ended at Blackpool in 2001-02 after longer, highly successful spells at Middlesbrough, Burnley and Preston. He returned to Bloomfield Road in 2006 to take charge of the youth coaching set-up, a position he held until a stroke in 2010 resulted in locked-in syndrome, which has left him paralysed. Gary, who turned 50 this year, remains a hero at all his former clubs but is far more than that as he confronts this cruel and debilitating condition. Gary is fully alert, his senses heightened, but he can’t move or communicate verbally. He is trapped in his own body, fed by a tube in his stomach and requiring 24-hour care. 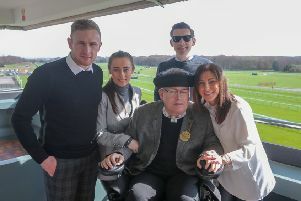 However, surrounded by the unstinting love of his family – Gary and Deborah have two daughters and a son, who pray every day that their dad will get better. Talking at their home near Bolton, Deborah speaks movingly about her husband. “Nobody can imagine what he is going through but Gary always had a great inner strength and he was unbelievably disciplined as a player,” she said. Twice he received the last rites as he clung on to life after the near fatal seizure eight years ago. “When he was fighting for his life he used that adrenaline and raw courage to stay alive,” Deborah added. “Those were dark days, and life has changed dramatically for Gary but we can’t dwell too much on what we’ve lost. “When I told the children the news about Gary’s illness, our youngest daughter was only six. “I said that I didn’t want to hide anything and I never have. “Sometimes, the nurses who come to help Gary say that they can’t believe how we do all this, but it is normal for us now because we are a very close-knit family. Gary and Deborah were childhood sweethearts. They met at school in Middlesbrough as teenagers – and bothturned 50 in January. Deborah marvels at people’s kindness and warmth, but you can only begin to imagine how she copes to see the man she loves stricken in such a cruel way. “We are incredibly proud of Gary – and the one thing that we all pray for is that one day he will be able to talk again. “Even after all this time, though, people haven’t forgotten Gary. This year they received a letter explaining that a deceased Burnley man had left money in his will for the Gary Parkinson Trust. Deborah said: “We didn’t know this family but I shake with emotion when I think about that. It was such an amazing gesture and touched our hearts. “Another kind person sent a £10 note and that’s just so humbling because they might be struggling themselves, but they’ve gone out of their way to think of Gary. “Then somebody delivered a couple of Subbuteo players, painted in claret and blue , and carrying the numbers Gary and David Eyres wore at Wembley (they were Burnley’s scorers in the Second Division, now League One, play-off final win over Stockport in 1994). When Gary had stroke the family were told his life expectancy might only be months. Those who fully recover from locked-in syndrome are very few. Deborah replied: “His body is locked but he knows who we are, where he is and what he wants to do. “His personality and memory have not changed, and he can tell us how he is feeling. Another great source of inspiration for them both has been their children, Sophie 14, Chloe 22 and 24-year-old Luke. Gary’s son is a sports journalist and his father is extremely proud of Luke’s achievements. Luke was studying at Runshaw College in Leyland when his dad took ill in 2010. He admitted: “I had to grow up very quickly and almost act like a father figure for my two younger sisters. And we must appreciate what we have now. To witness Deborah’s love and dedication for her husband is humbling and there is something truly reassuring about her presence. “I’m quite an old-fashioned person,” she adds. “When I made those marriage vows to Gary in 1991 – those words ‘in sickness and health’ – you made those vows for good and you stick together through it all. “I’ll always remain positive, be Gary’s wife and a mother for the family. “I love hearing about inspiring things, like the jockey Bob Champion who beat cancer to win the Grand National on the horse Aldaniti. “You can always defy the odds through the human spirit and we pray that Gary can.